Personalized Monogram Hollywood Style 18K Rose Gold Sterling Silver Bracelet. 18K Rose Gold Plated Sterling Silver Monogram Bracelet today and fully personalized it with up to three initials of your choosing. Monogram bracelets are just a small part of the greater trend of monogram jewelry. Now you can be fun and fashionable wearing your own unique bracelet with your initials. The Rose Gold Plated Silver Bracelet with your initials is very feminine and the perfect accessory for girls who love everything in rose color! Be fabulous and stylish while wearing the 18K Rose Gold Plated Sterling Silver Monogram Bracelet. 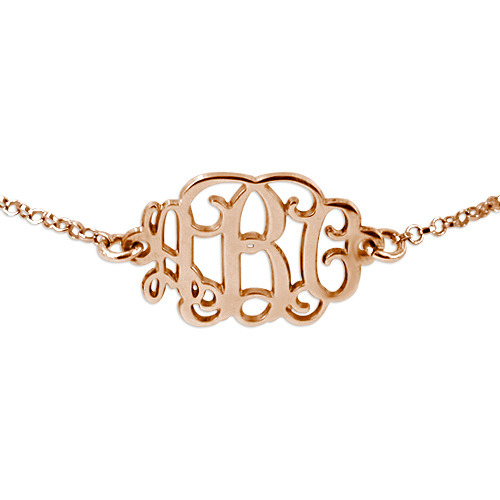 This monogrammed bracelet is also available in 18K Gold Plated and Sterling Silver (Optional). Made in real Sterling Silver 0.925. This is the perfect gift for any one and for any occasion. Height of pendant: 13.5mm x 21mm / 0.5" x 0.8"